This class is scheduled for Saturday, March 9th from 09:00 am to 4pm and will continue on Sunday, March 10th from 2:00 pm to 6pm. You must attend both days to be successful and earn your certification. The training will be held at the Art Smith Conference Center at the Nevada Area Council Office. Required deposit of $30.00 reserves your seat and is non-refundable, non-transferable. RSVP by February 22, to confirm your attendance as materials are needed to be secured for you. A definition of “wilderness” is a location that is 1 or more hours away from definitive medical care. Included would be remote communities, campsites, nature's playgrounds and even urban areas after a natural disaster. Also included would be remote areas where outdoor occupations are conducted (farming, mining, drilling, commercial fishing, forestry and some construction sites). Anyone living, working, traveling, or just enjoying the remote outdoors or wilderness areas should be prepared to manage medical emergencies. Wilderness first aid skills and thinking is needed for activities in remote areas such as hiking, biking, trekking, climbing, camping, atv’ing, sailing, boating, canoeing, hunting, snowshoeing, skiing, snowmobiling or any other outdoor activities in remote areas. 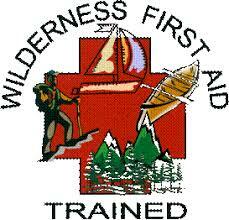 Wilderness First Aid is the immediate care given to an injured or suddenly ill person in a remote setting. It does not take the place of definitive medical care. It consists only of giving assistance until a more advanced level of medical care is obtained or until the chance for full recovery without medical care is apparent. Designed for those who work, travel or play in remote locations, this comprehensive program will teach you what to look for and what to do in the event of an emergency, build your skills and confidence, and direct you to the most appropriate type of care to ensure the best chance of recovery. At the end of the course, students will have to pass a written test. Upon successful completion, the student will receive a certification card good for 2 years. This program meets the Boy Scouts of America (BSA), Girl Scouts of America (GSUSA) and American Camp Association (ACA) guidelines. You can choose to pay the $30 deposit now and bring the other $30 on the day of the training or pay the full $60 now.